Happy Together by The Turtles was the first full priced album I ever bought. I had already picked up Donovan’s Universal Soldier – I vaguely remember that I bought it in Marple, a town close to where I lived. It was on the budget Marble Arch label new for 13/6 (that’s thirteen shillings and six pence, about 65 pence in decimal currency, a lot of money to me at this point). I’m not sure where I bought The Turtles album or how much it cost but I must have heard their two hits on the radio drawing my attention to it. Happy Together reached No. 12 on the UK chart and She’d Rather Be With Me No.4. in 1967. (Happy Together was a bigger hit in the US reaching No.1, She’d Rather Be With Me went to No.3). I don’t recall buying the album in the year of its release, I might have picked it up later on although it was probably before the end of the sixties. It was produced by Joe Wissert who I later met in Australia, he also produced Boz Scaggs Silk Degrees and albums by Earth, Wind & Fire, Helen Reddy and The J. Geils Band and seemed to be very rich. The album cover was intriguing and I wondered who on earth all these people were in the background. This was The Turtles third album and a return to the US chart reaching No.25. Early singles had hit the charts but their albums hadn’t done well, the first album only reaching No. 98 and the second not charting at all. Happy Together with its title track, changed all that and The Turtles became a household name with other hit singles to come, the biggest being Elenore and You Showed Me, both reaching the No.6 spot in 1968. Later after their label White Whale had financial issues, Howard Kaylan and Mark Volman the singer frontman duo aka Flo & Eddie joined The Mothers Of Invention as Phlorescent Leech & Eddie and went on to make a series of albums together in the seventies. See the links for info on The Turtles three different bass players and drummers. When I listen back to Happy Together I hear catchy sixties Sunshine Pop but not made by record company puppets. The fact that they went onto work with Zappa should be a clue as to the kind of characters they were. In fact, when you see their TV appearances it seems that they might easily get up to no good. Flo’s antics often playing instruments that weren’t on the song in order to point out that they were lip-synching might have been seen as slightly antagonistic along with their obvious irreverence in the face of their popularity. The first track, Making My Mind Up, has that sunny disposition, but the second track is something a little odd. A song from the Gene Kelly directed film, A Guide For The Married Man, starring Walter Matthau and written by famed musical lyricist Leslie Bricusse (Doctor Doolittle, Goodbye Mr Chips) and film composer John Williams responsible for Star Wars and Close Encounters – in the sixties fantastic themes to TV series like Time Tunnel and Lost In Space and it was he who actually played and wrote the opening riff to the famous, familiar Peter Gunn Theme! Volman and Kaylan’s, I Think I’ll Run Away, is next. It has a warm and soft sound, melodic with a classic sixties arrangement. Then, The Walking Song, a unique psychedelic cabaret that gives us a clue about Kaylan’s smart madness – presuming of course he wrote the lyric, the song is a co-write with guitarist Al Nichol. Bacon Fried, Squinty eyed, moments of the dawn. Misty street calling me, get dressed and walk around. In the square, standing there girl so sad, what’s the matter? and folks preach happiness when there’s none to be found. to keep me alive so I can waste another day. I sadly turned and walked away. For there was nothing I could say. could everybody feel this way? on clover beds neath a blanket of sky. Garry Bonner and Alan Gordon wrote the next three tracks, Me About You, Happy Together and She’d Rather Be With Me. 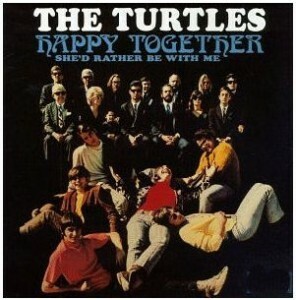 Happy Together was turned down various times by other acts before The Turtles made it a hit. You can hear the difference in depth between these three catchy tunes and their easy lyrics written by professional songwriters, compared to the deeper themes in Kaylan and Volman’s songs. Making My Mind Up, the opening song on the album was written by Jack Dalton and Gary Montgomery, the next track Too Young To Be The One is written by Eric Eisner – these are forgotten songwriters of the time, little is to be found about them on the net and it’s unsure that the people with the same names are the same people that wrote songs in their youth as they have often moved on to different careers. Who were these people where are they now? It would be so interesting to see a list of all the songs they wrote when they were active and hear them as performed by the artists that recorded them. Person Without A Care is another song from guitarist Al Nichol – Nichol was guitarist with the band for five years. The fate of original rhythm guitarist Jim Tucker remains a mystery. He was with the band for two years from 1965 – 1967 and quit the band. According to Wikipedia, after a promotional tour in England, allegedly being insulted publicly by John Lennon, as a Beatles fan, he never got over the experience and left the band and the music business forever – it’s such a heartbreaking story. Like The Seasons was written by the inimitable Warren Zevon. Zevon made his first solo album in 1969 initially with personality producer, Svengali? Kim Fowley who couldn’t find a way to assert his charms upon him – Zevon didn’t make his second solo album for another seven years. Zevon’s madness is a story in itself, he died of cancer in 2003 at the age of 56. The album finished with the totally mad Rugs Of Wood And Flowers and confirms their move to Zappaland. Some kind of operatic spoof it’s Sparks meets Gilbert & Sullivan at Nick Cave’s house, it sounds like it was recorded by lunatics – that know what’s really going on. On the Spotify link there’s three extra tracks that weren’t on the original album – two Bonner/Gordon tracks, She’s My Girl a 1967 US No.14 hit and You Know What I Mean, the previoius 1967 single that reached No.12 and that had Rugs Of Wood And Flowers as a B-side. Kaylan’s Is It Any Wonder from 1970, a song from the wrong period that didn’t chart, finishes the album for no reason at all. Perhaps this album’s peculiar see-sawing between light-hearted Pop and intellectual madness might explain my own peculiar tastes as it seeped into my young bones when I was a mere sponge.